Updated riverfront home in best Cape Coral neighborhood. 4 bedrooms, 3 full baths (pool bath), sliders from all living areas to the huge lanai and pool area. Cherry wood flooring in living areas, travertine tile in kitchen and baths, granite in kitchen and baths. 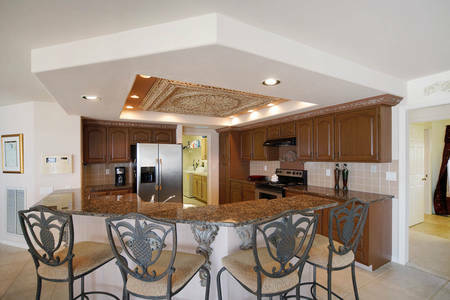 Gorgeous updated kitchen custom ceiling and bar. Built by Arthur Rutenberg Custom Builder.